With Printed Tapes available from as little as 99p per roll, it's time to grow your brand! Printed Tape produced by experts in the Packaging industry. Take a look at our impressive Printed Tape client portfolio. Printed Tape is great for sealing boxes and is also used as an effective low cost Marketing Tool. 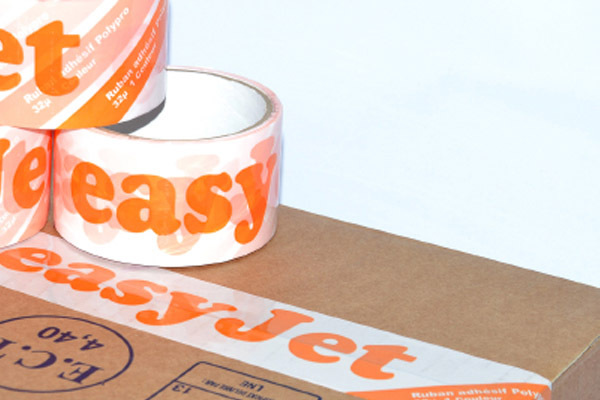 There are numerous advantages gained by utilizing a custom tape apart from just sealing your boxes securely, the continuous design acts as a visual tamper evident security measure and promotes your brand whilst in transit. It’s also a great product to increase your brand awareness. Contact us today for a bespoke quote. Printed paper tape has risen tremendously in popularity due to it’s Eco Friendly properties. We produce printed paper tape in many sizes and the types of paper tape we offer are water activated paper tape, or printed gummed paper tape. We can print 3 colours onto the paper substrate which comes in two colours, these are White & Brown/Kraft Paper. Printed Barrier Tape is a non adhesive tape that creates a divide or a barrier most commonly used at races, charity events and by the police. We can produce custom printed barrier tape in many sizes, quantities and colours. This tape is widely known as Barrier tape or Barricade Tape. The minimum order for barrier tape is 12 rolls. Personalised Washi Tape is a must have product for people interested in the Arts & Crafts, view our custom printed Washi tape page for more information & prices. It’s a great time to get involved and we’re here to help by offering minimum runs of personalised Washi tape starting at 100 rolls you can start your own Washi tape outlet or store filled with your beautiful designs. What is Printed Packaging Tape? This tape is printed with specific brand information and used to seal packaging materials such as cartons and cardboard boxes. Usually, printed packaging tape comes with specific handling instructions such as storage temperatures and the nature of the surfaces on which it can be applied. The beauty with this type of tape is that it gives you space to display your branding information thus raising awareness on your products. The printing may include alerts and warning messages to the handlers and shippers of your products thus ensuring they get to their destination damage free. The material used for the tape allows text to be printed on it with greater clarity which serves to amplify your brand message. For the best results, use the adhesive within a duration of 6 months or thereabouts from delivery. When it overstays, it may undermine its adhesive power. What is Printed Parcel Tape? Printed Parcel Tape is adhesive tape that has been printed with businesses details on such as your website address or brand logo. This form of packaging tape serves two purposes, the first one being that it securely seals your goods by sealing your box ready for dispatch. The second reason is that for every person that sees your box during the delivery process it is informing them about your brand and service, essentially it is marketing your product or brand during it’s journey from you to the end user. What is Printed Adhesive Tape? Printed adhesive tape is printed packaging tape that’s essentially customised with your business details providing a more secure and professionally branded low cost marketing option for you business. Custom printed tape is a product that is both for external marketing purposes and essential for your products packaging. Over the last 20 years the use of printed tape has grown massively thanks to the internet and e-commerce as more and more businesses are growing due to e-commerce. Custom tape is also known as custom packaging tape. Printed custom tape otherwise known as personalised tape is becoming more and more popular, the main reason being that it not only seals your boxes of produce but also adds value to your branding efforts. A unique tape helps to easily identify your boxes in transit and spreads your brand or business details by attracting the attention of people who see your parcel during its delivery stages. Not only that, but a printed parcel tape will help to reduce theft and pilfering of goods from your deliveries as the unique seal provided via the continuous design makes it incredibly hard to steal from the bx without obvious signs showing on the box and the tapes continuous design. What is Paper Packaging Tape? Paper tapes are essentially tapes that are eco friendly because they are composed of paper and not polypropylene or vinyl. All of our paper tapes are water resistant and work extremely well in humid conditions making it a great choice if you export worldwide. We can customise our paper tapes, printing on paper tapes creates a custom printed paper tape which can be printed in up to 3 colours onto a base material, artwork design is free on orders over 50 rolls. Paper packaging tapes also provide an extra layer of security as they create a tamper evident seal, you can not remove a paper tape without the residue being visible and it is harder to replace paper tapes when compared to a plain or brown tape that are easily available. We provide 3 types of paper packaging tape our most popular being self adhesive paper packaging tape which leaves a neat finish and is a very popular choice for quickly sealing packages. We also produce gummed paper tape which has extra strength due to its thicker paper and gummed backing, it is water activated and forms a strong permanent seal that if removed, it clearly shows visible signs of product tampering which increases the security element. For extra strength we provide a reinforced paper tape, ideal for heavier items providing maximum strength, security and stability. Logo packing tape is essentially a printed adhesive tape that is most commonly used to seal your parcels and boxes. As the name suggests there is a marketing element to it as you can promote your business with each and every delivery of your product. It is also an extra security measure as the continuous design once broken provides an obvious signal that your parcel has been opened. The low cost of custom packaging tape means it is also very cost effective when you think of the dual purposes it serves. We can produce custom tapes from as little as 99p per tape roll. It’s easy to order from us, we’re here to help, we provide the whole service from Artwork design all the way through to the manufacturing, quality checking and delivery to your business. Contact us today. What are the specifications of Printed Tape? We can produce printed tapes in many sizes and widths that fall between mm and mm . Our standard specification of tape is 48 mm wide and 66 meters in length. We can also cater to specialist request that require us to edit the sizes and lengths. We can produce printed packaging tape in p to 3 colours as standard, and in special circumstances we can print true colour photo HD tapes subject to a minimum order value. Pan-tone colours, reverse print and a material selection are also available. We offer a range of tape materials, the most common being Polypropylene tape offering a great glossy finish and Vinyl tape that offers a premium matte finish. Our eco-friendly solution is a printed paper tape. Paper tapes are strong and are fully recyclable offering a high-quality organic finish. What is Bespoke Packaging Tape? Bespoke Packaging Tape is what would otherwise be a standard or plain tape, printed with your company logo, details, phone number or emblem. Investing in a branded tape adds a marketing element to your business and increases our brands awareness at the same time. You will also benefit from increased security as it is very hard to open a parcel without breaking the continuous design that a custom tape provides. More of your parcels will reach their destination without being pilfered or stolen in transit. The low cost of producing printed tapes means it is also an affordable marketing tool, so much so that we can produce full sized bespoke rolls of tape from as little as 99p a roll. How much does Printed Tape cost? We produce printed tape for as little as £1 per roll. View our Printed Tape pricelist and buy online. Polypropylene tape is made from a film material which is widely used for packaging applications, such as Carton Sealing Tapes, Tamper Evident Tapes and Strapping Tapes. Polypropylene films are available with or without adhesive. How long does production & delivery take? We have various production and delivery options available. Each print run can be produced in one of three turnarounds. These are “Super Saver” which means your order will be produced and delivered to you within 21 days. The next service is “Standard” using this service will ensure your packaging tape is with you within 14 days, and finally we have our “Premium Turnaround” which guarantees your tape will be with you in 3 to 7 days. Where do i send my artwork to when i order? That’s an easy one, send the artwork containing your tape design to sales@printedtape.net , if you could include your order number that would be great! What are the different widths and lengths of tape you produce? We can print tape in widths from 12 mm all the way up to 144 mm wide, this gives you the flexibility to purchase a tape that suits your needs. Why is the minimum order 36 rolls? To be economical in the way we produce tapes the minimum order is one box of 36 rolls, the set up procedure of the machines and the plate and design checking, boxing, labeling and dispatching orders means the price for 1 roll is the same for 36. We could sell you 1 roll but it would be the same price as 36 rolls so that’s why you see the industry minimum orders range between 36 and 72 rolls. What is meant by the Origination / Plates cost? Flexographic printing of packaging tape requires us to manufacture printing plates, this is a “one off bespoke” process required to successfully print your job. When you re order the exact same tape with us in the future there will be NO plate cost as we will keep the plate in stock for you. We can also waive printing plate costs on orders over 288 rolls. If you'd like a personalised tape quote, please fill out the form below and we will get back to you as soon as possible. Please log in or register to view our prices. Register to view our prices, it takes 10 seconds.